The traditional barns were recently re-built and re-furbished and are decorated and equipped with virtually everything you would expect in a modern home, including underfloor heating, dishwashers, washer/driers, LED TVs and WiFi. The bedrooms are bright and welcoming, with hardwood furniture and sumptuous bedding; each master bedroom is a luxurious place for couples, whilst the second bedroom is cheerful and imaginative space for youngsters. The sitting rooms are contemporary and comfortable, with plenty of seating and soft cushions, along with HiFis for music lovers, which incorporate either bluetooth connectivity or an iphone docking station. The bathrooms have both a full size bath and power showers and the kitchens are modern, spacious and fully equipped. Outside, each property has its own private and gated deck area with a barbecue, plus hardwood table, parasol and seating. The surrounding lawned area, gardens and the fantastic views are for all guests to share. Both barns are ideal for families with young children, offering safe enclosed grounds and a play area with climbing frame, slide and swings within view. Also, to save you loading the car to the gunnels, we have provided a comprehensive range of baby equipment including cot, highchair, stairgate (for The Byre) baby bath and changing station. Whilst both barns can easily accommodate 4 persons in their two bedrooms, there is also the option to make it 5 in each. The second bedroom of Skyber has a small double bed and a full size single (plus cots can be provided). The Byre also has a very comfortable fold out sofa bed, in addition to the second bedroom, with it's full size bunk beds, so if you need to accommodate some extra guests for a few days it won't be a problem. Having said all of the above, the main attraction of Tregear Barns is their location. In the centre of Cornwall - but away from it all - it is an ideal base for touring and a wonderful retreat at the end of a hard day exploring all that Cornwall has to offer. Tregear Barns are bright, clean, comfortable and equipped with everything you could need for a family holiday. 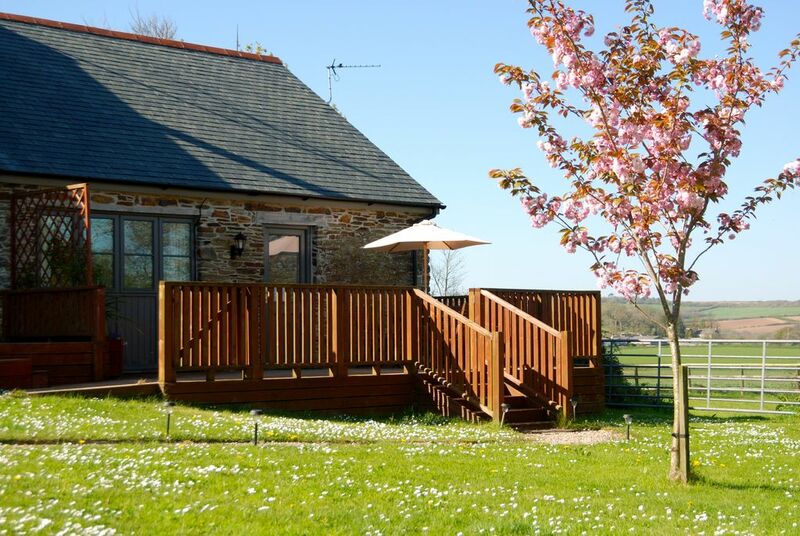 There are just two holiday barns on what was a working farm, located on a quiet lane just 3 miles from the A30 at Carland Cross amongst rolling fields and woodland. The location whilst almost always peaceful and quiet as well as safe and secure for children is ideal for accessing all of Cornwall's attractions. The north coast is around 25mins drive to get to beaches such as Fistral, Perranporth, Watergate Bay etc. Equally St Austell and the Roseland Peninsula are a similar distance. Our guests all comment on both the calm beauty of the location and how easy it is to get to the likes of The Eden Project, The Lost Gardens of Heligan, Mevagissey and St Mawes. Truro itself is often overlooked. It has lots to offer in terms of entertainment and is only 10mins away. The views from the cottage were beautiful. It is a really pretty setting. We all had a fabulous holiday. It was in driving distance of lots of great beaches. Children loved the play area. The owners were really helpful when I couldn't work the washing machine. Thanks for a great stay. Many thanks for staying at Tregear and for your kind review. We are really pleased you enjoyed your stay and hope to see you again. Thank you so much for taking the time to write this review. I should stress for future guests that not everyone gets fruit cake (often it is scones!). We try to make our guests welcome and help them to settle in to either Skyber or The Byre. We are nearby if anything is needed or needs fixing, but otherwise you probably won't see us until you are leaving - and if it is early in the morning not even then! So sorry we did not get the chance to say goodbye, but we are delighted you really enjoyed your stay. We enjoyed a lovely 7 nights stay at The Byre. The barn is immaculately decorated in a modern and very homely style and is equipped with everything a family could need. Loved all the child friendly touches from change stand to cutlery. Our boys loved the large garden and play area. It is in the perfect location to relax and explore all that Cornwall has to offer. We specifically liked Dairyland and Perranporth Beach, to name just a few. Steve and Judith are lovely hosts, from the fresh cream tea on arrival, to advising on great places to visit or just being on hand if we needed help with anything. We would recommend The Byre to anybody that is looking for stunning views, in a peaceful base for a holiday in Cornwall. Thanks again Judith and Steve. Thanks Jennifer - really appreciate you taking the time to do this. That is exactly what we were aiming for! We wanted to make it easy for families to stay - so have included virtually all of the little things that babies and toddlers might need, such as a baby bath, changing mat, highchair etc as well as providing a safe and secure area to play on the gated decks or in the garden. Having said that we get couples who also like the views and the peace and quiet and the decks outside the barns are a nice place to read and relax, whenever you get the chance! We do try to be around to help or advise on places to go or things to do whenever needed, being just next door, but if we are not needed, we just leave our guests their privacy to do their own exploring. All the sights and attractions of Cornwall are pretty easy to reach from Tregear, but as I know you will agree, it is nice, quiet and picturesque to come back to at the end of the day. We do hope you and the family get the chance to come and stay again soon - though we know its a long way from where you live but we look forward to welcoming you back whenever that may be. We stayed at The Byre for 4 nights. The accommodation is fabulous - contemporary, tasteful and comfortable and so well equipped. Added to that is the wonderful view - the terrace is private and looks out over the beautiful countryside. Judith and Steve couldn't have been more welcoming. We enjoyed an extremely delicious welcome treat! Tregear is well placed for both north and south coasts, and we enjoyed days in St Ives and St Mawes, and NT gardens. This is a great place for couples as well as families. It is as good a holiday home as we have ever stayed in. I would definitely recommend it. Thank you for staying with us and for such a warm and positive review. We hope you can come and stay again and look forward to welcoming you back. Great location for exploring the peninsular. We had a fab short break and the owners were really helpful and provided a bbq at short notice. The barn is very well equipped and had all the facilities to keep us comfortable. Stunning views from the deck and incredibly peaceful. We stayed here with our children aged 6 and 4 and had a great week. The cottage itself is very nicely decorated and furnished, was very clean and everything was of a really nice quality. The kids loved the bunk bed room with their own TV and the upstairs double room has a lovely view. The cottage is well located for both the north and south coast as well as Truro and Falmouth and is close by to lots of tourist attractions and several National Trust properties. The owners are friendly and welcoming. We were even greeted with home-made hot cross buns! We had a lovely introduction to the cottage and were then left to enjoy our holiday safe in the knowledge that we could call on them if there were any problems. Thank you - both for your stay at Tregear and for taking the time to write this great review, which is really appreciated. We are delighted you enjoyed your stay and hope to see you all here again soon. The Byre is situated in beautiful rolling fields on what was a working farm. Whilst situated on a quiet lane in hundreds of acres of fields and woodland, it is however only 3 miles from the A30 at Carland Cross. It is 10 mins by car to Truro and our location is equidistant for both the North Coast, around Newquay, Perranporth and St Agnes and the south coast at St Austell and the Roseland Peninsula at around 20-25mins drive each. Nearly every attraction Cornwall has to offer is within a short drive. The Eden Project, The Lost Gardens of Heligan, Mevagissey & St Mawes, Watergate Bay, Fistral beach, Holywell Bay & Crantock and Perranporth are all wonderful places to visit and each easily accessible. What every visitor likes, as well as the comfort the barns offer, is the peaceful seclusion combined with the opportunity to see all of Cornwall.